Lesser Glow Ruined Debut Out on Pelagic Records Now.Lesser Glow Ruined Debut Out on Pelagic Records Now. Home Short Cuts Lesser Glow Proves That Doom Metal Can Be Greater. 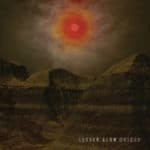 Lesser Glow Proves That Doom Metal Can Be Greater. Type O Negative, Failure, Quicksand, Saint Vitus, Rush, and Unsane. THE SKINNY: Boston-based quintet Lesser Glow, is Andrew G Nault (ex-Black Elm), Scott Conza (ex-Black Elm, Max Jupiter), Ben Gram (ex-Irepress), Seth Botos (Undersea), and Alec Rodriguez (ex-The Proselyte). All members are seasoned and skilled musicians. This is not your standard-issue doom or prog metal outfit plowing the same depleted metal fields. Their ground-breaking approach is dense, deliberate, atmospheric, prodding, delicate, and precise. It’s not hyperbolic to call Ruined one of the most innovative and important doom metal releases of the year. We predict big things for the boys. THE DISC CONNECTS: Although the six-song EP clocks in at under 30 minutes, Ruined more than delivers its payload. Their music seems to shape-shift, bend time and space, and envelope the listener in epic travels and journeys of the mind. This is definitely a headphone experience to tune in, drop out, and chill. SELECT CUTS: Opening track, “Ruined,” is a lead-footed, Quaalude dirge that uses space as an instrument. Dramatic and tortured, there’s a sense of dread and gravity-free floating ala Black Sabbath or Alice In Chains. Rodriguez’s vocals oscillate from the guttural and tortured sound of a Phil Anselmo, to the soulful, wounded space metal of Ken Andrews of LA’s Failure. Another standout track is “Fall On Mortal Decay,” an ethereal, goth-like musical bed that erupts into an infinite black hole of sound and decaying dying vocals. Closing track “Under the Polar Shade” is a song that belongs on the space station. The intro has strains of Rush’s epic opus “Cygnus X-1.” Ruined succeed massively in creating mood, headspace and bending the arc of time to their will. WHY YOU SHOULD CARE: Lesser Glow infuses new energy, innovation into a genre that’s become a bit predictable, stale, and formulaic. The only remaining question is this: Can they pull off this album live? For select US fans, that answer comes soon. BUY: Their Pelagic debut is already ready to take home and enjoy over and over. Ruined is available on CD, LP and in digital formats. This is one of the most essential metal releases of 2018. Previous PostSoul Asylum: Soul Survivors. 7/21 Hollywood Casino Amphitheater. Next PostPhantastic Ferniture: Bittersweet pain pop vignettes.